Brad Pfau, Family Service Manager for Palm Beach Memorial Park cemetery in Lantana, shows marble mausoleums for one or two people, starting at $7,000. POMPANO BEACH, Fla. — Just because you’re dead doesn’t mean you have to slum it underground. Ask Edward Guastafeste, a Boca Raton, Fla., retiree who built a manufacturing empire selling showcases for retailers. About 10 years ago, he built his family vault off East Copans Road. Just follow the boulevard of crypts at Forest Lawn Memorial Gardens and a hulking granite edifice comes into view with the words “GUASTAFESTE-BRUNO” chiseled across the pediment. In the ritzy corners of South Florida cemeteries, the prosperous dead maintain their quality of life. Some in the cemetery industry say the market – and we’re all customers sooner or later – wants fancier digs in the hereafter. Banking . That means indoor mausoleums, granite walls, private estates and even air conditioning. “There’s a growing market in South Florida,” said Ron Browning, CEO of Forever Legacy, a high-end entombment dealer based in Texas. He also runs Mausoleums.com, which curates a database of glamorous tombs. These go from conservative neo-classical to Egyptian pyramid style to, literally, a children’s playhouse. When 4-year-old Nadine Earles died in Alabama, her parents built a little brick house – chimney, porch, shingles and all – in a nearby cemetery, according to Browning’s site. Comedian Jackie Gleason rests in a column-flanked sarcophagus in Miami that you have to climb a flight of stairs to see up close. And Wayne Huizenga, founder of Waste Management, Blockbuster Video and part owner of the Miami Dolphins, has a quiet part of Evergreen Cemetery in Fort Lauderdale waiting for him when he dies. His is one of the more humble structures along that cemetery’s mausoleum row. “Most people don’t do it for a status symbol,” said Douglas Kinzer, a past president of the Florida Cemetery, Cremation and Funeral Association, who runs The Gardens Memorial Park in Boca Raton, Fla. His cemetery offers the gamut, from the basic coffin-sized plot and a flat marker to room-sized granite tombs. Most people who choose mausoleums, he said, want to make sure their families can visit them comfortably and have a nice place for them when they die. “They want their afterlife to be the same as their life on earth,” Kinzer said. And they pay dearly for it. Cemetery managers say mausoleums start as low as $40,000 and easily climb into the millions. Some hold one or two people. Some, intended for multiple generations of posterity, can fit more than 20, or more if the remains are cremated. They cater to people with a huge net worth, corporate executives and the like. Call Browning from anywhere in the country, he said, and he’ll be on a plane the next day to talk about options. office for rent bookkeeping He’s got a portfolio of mausoleum design concepts. One of them has turrets and a moat. “We kind of take it to the nth degree,” he said. The management at Palm Beach Memorial Park, in Lantana, Fla., recently began advertising its nonexclusive indoor mausoleum with “air conditioned, carpeted, elevator . Italian marble fronts.” Michelangelo prints hang on the walls. 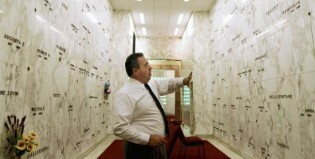 “People have a perception that mausoleum burial is only for the very wealthy,” said Brad Pfau, family service manager. Private mausoleums are, but if you don’t mind having neighbors, prices plunge. Crypts five rows above the floor, they said, are on sale for just $395 down and $60.30 per month. The Memorial Park is trying to make swanky accommodations affordable to most people, Pfau said. “I would like to be in a unique and grand mausoleum,” Browning replied to a question about his own burial plans.